Create animated Blueprints yourself starting with a Trial Account here. Take a peek at the Dragon1 Step-by-Step Guide. This example IT Infrastructure Architecture Blueprint is created on Dragon1. Dragon1 is a collaboration platform, on which you as Business Professional can learn, create, share and control interactive content. 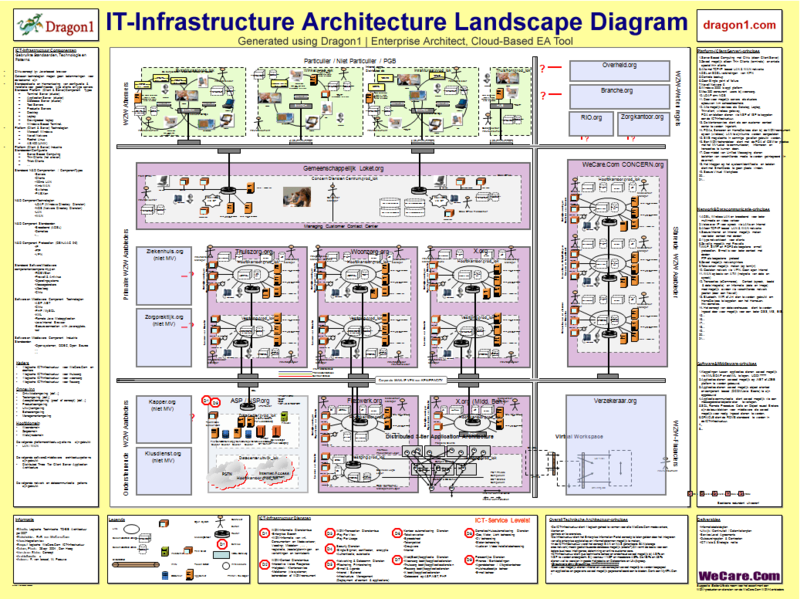 What is an IT Infrastructure Architecture Blueprint? The blueprint is a building plan for the IT Infrastructure of an organization showing the IT concepts that are part of the IT architecture, the elements of the concepts and the components that implement the elements. IT Infrastructure Architecture Blueprint is also a synonym for IT Infrastructure Landscape Diagram or IT Infrastructure Diagram. We hope we have inspired you to start creating IT infrastructure architecture blueprints. If you do not have the time and you need an IT Infrastructure Architecture Blueprint on short notice, we can Create a Blueprint for you.